Horlicks brand has grown in volume to become India’s largest in the ‘health food drinks’ category, occupying nearly half the industry market share. Horlicks madhi” (Malayalam for “Only Horlicks”) is what Sanjeev Bikhchandani remembers from his days in the brand management team of Horlicks, 30 years after he ended his association with the company. Bikhchandani, since then founder-owner of Info Edge that owns naukri.com, Zomato and Bharat Matrimony, among others, says that he remembers hearing the phrase and its other regional variants over and over again when he traveled across parts of South India in 1989, when he joined the company. Since then, the Horlicks brand has grown in volume to become India’s largest in the ‘health food drinks’ category, occupying nearly half the industry market share and clocking over Rs 3,000 crore in sales in FY’17. So earlier this week, when Unilever announced the merger of its India unit, Hindustan Unilever Limited (HUL), with GlaxoSmithKline Consumer Healthcare (GSKCH), thereby acquiring the Horlicks brand globally and absorbing Boost, Viva and Maltova brand into the merged entity (HUL and GSKCH), it created a splash in the corporate circles. As part of the Rs 31,700 crore acquisition deal, while Boost, Viva and Maltova will be owned by Hindustan Unilever, Horlicks will be owned by parent company Unilever, with HUL paying a royalty for its use in India. The deal also makes HUL, India’s largest consumer goods company, the country’s largest listed foods company. As news of the deal flashed into drawing rooms, many wondered what it would mean for the sugary malt drink they had grown up drinking. An apocryphal story about Horlicks is that the drink first came to the country along with Indian soldiers who returned from Europe after World War-1. The drink, imported and sold in India in the early 20th Century as a nutrition supplement “to boost energy levels”, was called Diastoid by its British inventors William and James Horlick with an advertising slogan that read: ‘Horlick’s Infant and Invalids Food’. With a change in import policy in 1955, sales of Horlicks in India stopped for a couple of years, before the company set up its first plant in Nabha, Punjab, in 1956-57. Over the next five decades, the company witnessed several change of hands. Yet, what remained steady was Horlicks’ dominance of the health food drink market despite the entrance of competitors such as the Cadbury-owned Bournvita and Complan, then owned by Kraft Heinz (Complain was recently sold to Zydus Wellness). 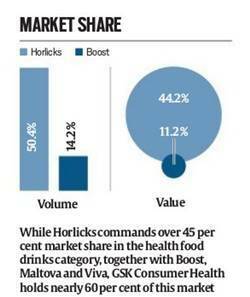 While Horlicks commands over 45 per cent market share in the health food drinks category, together with Boost, Maltova and Viva, GSK Consumer Health held nearly 60 per cent of this market. For Horlicks, East and South India have traditionally been strong markets, accounting for roughly 80 per cent of its sales in the country. Bikhchandani says that around 1990, Tamil Nadu was the largest market for Horlicks, accounting for 32% of national sales, followed by West Bengal that contributed 19%. Bikhchandani has his explanation for the popularity of the drink in these markets. He says that until Operation White Flood in the 1970s, India was by and large a milk deficient country. While the north and the west of India started to come out of the milk shortage in the 1980s, it took time for the eastern and southern states to bridge this gap — that helped since Horlicks was marketed as a nutrition supplement that could even be mixed with water. North and West India, says Bikhchandani, have since remained more “brown milk” markets, where Bournvita and Boost have traditionally done better business. GSK Consumer Healthcare stayed the market leader in the country’s health food drinks sector simply because Horlicks accounted for half the products sold in the category by volume. To buy out GSK’s consumer healthcare business, which owns the beverage brands, HUL will issue 4.39 of its shares for every share of GSK Consumer Healthcare — a deal that values GSK Consumer Healthcare at Rs 31,700 crore. This transaction means that Unilever, the international promoter entity of HUL, will have to let go of some of its ownership of HUL, which will be given to GSK. As of now, Unilever owns 67.2 per cent of HUL’s shares, with 32.8 per cent held by the public. Once the deal is completed, Unilever’s shareholding will come down to 61.9 per cent, and public’s shareholding will drop to 32.4 per cent. The remaining 5.7 per cent of HUL’s shares will be held by GSK. Market experts say the deal will propel HUL to become the leader in the health food drinks segment, an industry in which it had no presence until now. Nationally HUL’s share in the ‘Foods and Refreshment’ market, of which ‘health food drinks’ is a sub-category, will see an impressive jump from 18.4 per cent to 27.8 per cent, according an analysis done by Edelweiss, a leading financial services firm. GSK’s decision to sell its health food drinks to Unilever this week comes less than two months of Kraft Heinz’s decision to sell Complan to Zydus Wellness. Industry insiders say that while growth stagnation within the segment was one factor that led to the exit, the other is the global trend of consolidation and shifting of focus to core businesses. In March, GSK had announced that it would buy Novartis from their joint venture to solely own products such as Sensodyne toothpaste and Panadol headache tablets, among others. Just as this deal worth US $13 billion was announced, the pharmaceutical major came out with a declaration that it was starting a strategic “review” of its consumer nutrition businesses, which most prominently included Horlicks, to fund the Novartis deal. The statement led to a flutter among several potential buyers, among them PepsiCo, Reckitt Benckiser, General Mills, Danone, and Kellogg’s. By the end, however, it was down to CocaCola, Nestle and HUL, with HUL outbidding the others. Despite the big move, HUL will be aware that it has entered a weakening market. According to a report quoted by HUL in its investor presentation this year, while the health food drinks segment grew at a compounded annual growth rate of 16 per cent between 2009 and 2014, the growth rate declined to 6 per cent in the following three years. While the report expects a growth of 9 per cent between FY’17 and FY’22, with a market size of Rs 11,900 crore, it is much lower than the current growth rates of the food, personal care and home care segment. Industry experts, however, say that with its deep pockets and deeper reach into the Indian market, HUL has the potential to act as a catalyst for the health food drink segment. “The malt-drink market has been struggling to grow and the deals in the segment may see new players using their retail network to penetrate deeper and thereby grow,” says Arvind Singhal, CMD of Technopak Advisors, a retail consultancy firm. For HUL, the opportunity lies in the fact that the current penetration of the health food drinks segment across the country remains low at 24 per cent and is further low at 14 per cent in rural India. “There is tremendous potential in the segment as the penetration levels remain very low not only in rural markets but also in bigger cities and towns,” a senior HUL official told The Sunday Express. He added that with HUL focussing on heath and wellness, the addition of Horlicks, Boost and Maltova will add to this thrust. HUL, he says, hopes to do this by riding on its huge distribution network — while GSK Consumer Healthcare has a network of 1.8 million stores, HUL, with 7.5 million distribution partners, has four times the reach. “GSK has a strong network among retail chemists but not in kirana shops. HUL, on the other hand, has a strong presence in kirana retail and can use their network and strength to push Horlicks sales. Besides, GSK is largely in Tier 1 and Tier 2 cities and HUL, which has a strong presence in Tier 3 cities and rural markets too, has an opportunity to push it in these new markets,” says Singhal of Technopak Advisors. An immediate impact of the deal, therefore, could be more satchets of Horlicks strung outside the neighbourhood kirana store. What remains to be seen, however, is whether the deal will make the Horlicks brand, as its tagline says, “taller, stronger, sharper” and revive the flagging malted drinks category?